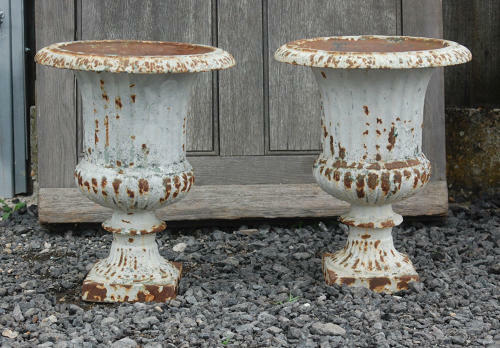 A pair of decorative, cast iron, reclaimed urns that have a fantastic weathered, shabby chic, style. The fluted urns have a traditional, period look and the fluting is continued from the main body of the urn to the base. The bowl rim has an attractive design. The urns are reclaimed and therefore have some signs of use and wear. The paintwork is peeling and chipping in areas, exposing some patches of surface rust, giving the urns a wonderful weatherd effect. The inside of the urns have surface rust. There is a large crack to one urn, around the central ring of the piece. The crack does not affect the stability of the urn and it is still solid and useable, however we reccomend that the urns are used inside to prevent the crack worsening or breaking due to frost. The urns would give great style and interest to a room. The urns could be used to hold plants, decorative items or could stand alone, their slim size making them perfect for an interior. The urns could be refinished by purchaser if desired or the weathered look left. Urns such as these have great stylistic value and would compliment a period home or shabby chic style interior.